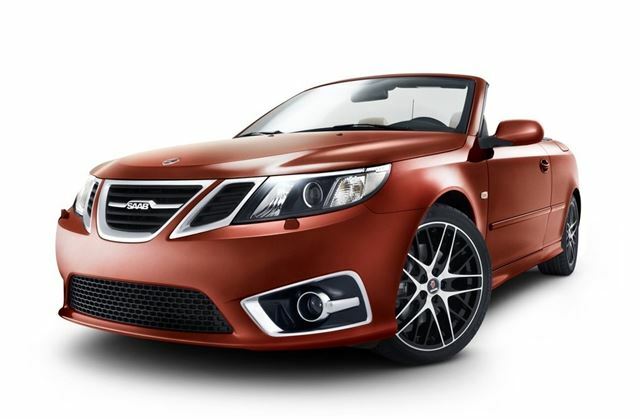 Saab is 'celebrating' the first anniversary of its independence by launching a special edition of the 9-3 Convertible. So instead of just having a big party in the snow, the brand has introduced the aptly named Independence Edition of its 9-3 drop-top. Apparently just 366 examples will be produced, one for each day during the first year and one extra for the start of a second year. Yes, we're confused too. However, only 80 of these vehicles will be produced for the UK, ensuring its 'exclusivity'. Unveiled at Saab's assembly plant in Trollhättan as part of a day of celebration, the Independence Edition features a unique, Amber Orange metallic paint finish. It is based on top-of-the-line Aero specification and includes a limited edition serial number etched into the rear side windows. It also gets special extras including five spoke, 18-inch alloy wheels with a satin chrome/black finish, 'parchment' sport leather seats and glovebox with amber orange highlights, a carbon-fibre look leather finish for the instrument panel, handbrake, gearshift and door handles plus an orange stitched sport leather steering wheel and carpet mats with grey piping. The sole engine available is the 180bhp 1.9-litre twin turbo diesel with a six-speed automatic transmission. The Independence Edition follows a tradition of special Saab Convertible models launched at springtime. This year also marks the 25th anniversary of the start of sales for the first Saab Convertible.